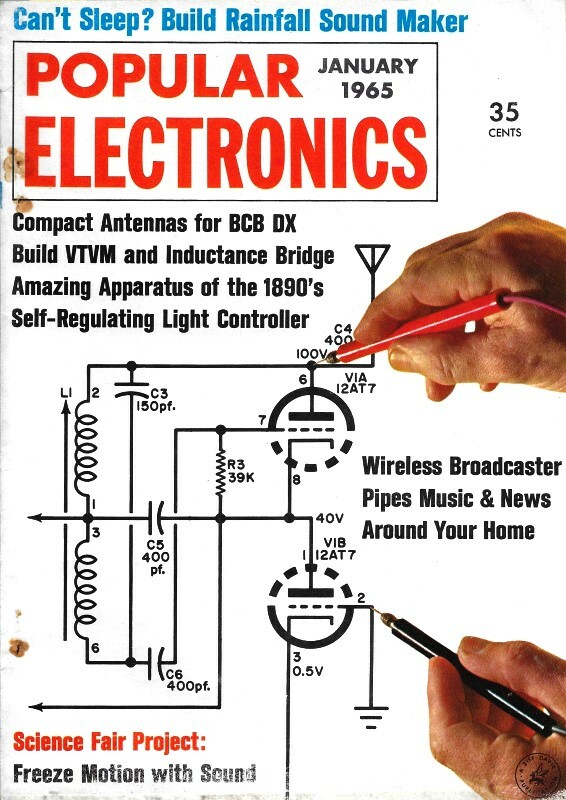 Allegory is not an often seen style of prose in the electronics writing world, and typically is not meant to be humorous; however, there have been a few instances of it in the vintage electronics magazines I read. One of the most famous examples of allegory is a story by Paul Bunyan titled "Pilgrim's Progress." "She Wore a Red Germanium," by Leta Foster Ide, is a more contemporary form of allegory that RF Cafe visitors will appreciate. Mike R. Fonic (microphonic) is the lead character in the story who complains to his doctor, "I'm off my feed. Got no capacity. Fact is, I'm in a breakdown." Mike's wife's Aunt Enna (antenna) is no help, evidently. 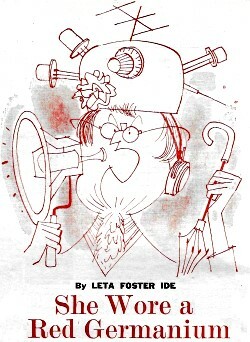 Come to think of it, the author's name, Leta Foster Ide, almost sounds like it might be a play on words, to wit, "Let A Foste Ride" or "Let a Foster Ide" (whatever those might mean). Nope, Leta's byline can be found in many magazines of the era. 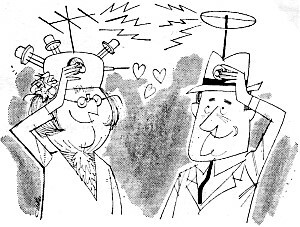 You might also like another allegory which appeared in a 1943 issue of QST titled, "Who Killed the Signal?." 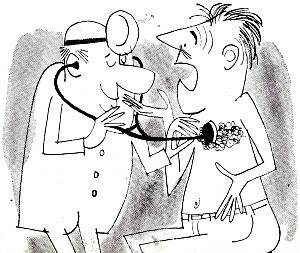 Mike R. Fonic, chief technician for Happy Henry's Hi-Fi Hippodrome, went to see his doctor. "What's the matter, Mike?" the physician asked. "Watts your current problem?" "Doctor, I'm only half a life!" Mike moaned. "I'm off my feed. Got no capacity. Fact is, I'm in a breakdown." "Oh come now," the doctor protested cheerfully. "It can't be that bad. A little component aging, perhaps. But what do you expect in your voltage? How's your pulse rate?" He reached for his patient's wrist. "But Doc," Mike insisted, "I tell you I'm a terminal case. I'm short-circuited." "Nonsense, Mike," the doctor replied. He pushed a thermometer into his patient's mouth, probed deeply into his diaphragm, and examined his solenoids. "It's nothing of specific gravity," the doctor concluded. "Your resistance is low, your temperature point is up, and your heart pulsations are somewhat erratic. How long has this condition persisted ?" "Faraday. And Faraday about two weeks ago." "Then it's only intermittent. Something must be bugging you either at the office or at ohm. How's your ohm life?" "Terrible, Doc, terrible. It's my wife's Aunt Enna. She's driving me hard." "Yeah. She comes with high frequency and leaves with reluctance." "I see," the doctor said. "Then for all practical purposes the situation is static? And she bugs you, eh?" "Yeah. It's her constant interference. And her impedance. And her loud voice." "She's a loud speaker, is she?" "You said it, Doc! A real woofer." "Can't you tuner down? Ask her to reducer volume?" "Not that old baud. She isn't about to modulator voice." "You've tried to rectifier?" the doctor asked. The doctor reached for his prescription pad. "Well ... I'll give you something to anodize your nerves and get your feed back." He scribbled on the pad. "Here. This should reduce your sensitivity. Take two quartz every three hours." "Thanks, Doc," Mike said. "I node you could fix me up." "Yes, over a short range. But these are just palliatives for your hysteresis. What you need is a long-range schematic to clear up the Ant Enna problem." Perhaps you've been using the wrong approach," the doctor suggested. "If you'll analyzer, I think you'll find that she behaves as she does because she's lonely and frustrated." "Yes, yes, I know. She keeps you under high tension; but that's because she lives in a vacuum. Having no interests of her own, she channels her energies into disrupting your balance. I suggest you getter into a bridge circuit. Take her out to local receptions." "You couldn't cell her on the bridge, Doc. Cards repeller. And I'm not about to take that old walkie-talkie to any reception." "You see!" the doctor exclaimed "The trouble is, you resister. Instead of trying to suppressor, you should learn to acceptor." "Resister! Suppressor! I can't even interrupter!" "She isn't married, I take it?" the doctor asked. "Naw. A typical old maid." "I see. She's probably starved for affection. If you'd tweeter nicer, maybe you could transformer. Play a.c.-d.c. with her. Buy her joules." "That's no good, Doc. I tried to overcome her bias when the wife and I were first married." "You're positive, then, that the plan has no potential? Well ... if you can't converter, and can't acceptor, the only alternative is to get rid of her." "I've thought of that. There are times I'd like to decapacitator, but I don't know if I conduit. What if she puts up resistance?" "Well ... assault and battery isn't quite what I had in mind. There's a better way to transmitter. Simply conductor to the door." "She wouldn't budge," Mike gloomily. "Well, then, here's another brain wave. If she's so noisy, she probably disturbs the other tenants. Try secondary emission. Call the management and let the superconductor." "Naw! She'd raise such a howl, she'd get us all evicted. And if Antinode I'd called the super, she'd think up some way to get even." "There must be some solution," the doctor said. "Let me think a moment ... I have it! This old lady is at loose ends. What we should do is connector." "I don't get you, Doc." "I mean coupler. Marry her off." "You're way off the beam, Doc," Mike protested. "Your attitude is negative, Mike. Can't you engineer an induction ?" Mike thought it over. "Hmm," he said. "I sure would like to unloader." Suddenly his expression brightened. "The idea gives you a charge?" the doctor asked. "Positive! I can see the pictorial now! There's my boss, Happy Henry. He and Ant Enna are two of a kind." "You think they deserve each other?" "Sure, Doc. A matching pair! We pull a switch. Instead of both bugging me, they can bug each other. How's that ?" Mike beamed from ear to ear. Then his face fell. "Do I detect a flat response?" the doctor asked. "Why the image rejection ?" "It won't work," Mike said glumly. "How am I going to make this hookup? Where's my lead-in ?" Oh, come now, Mike," said the doctor. "Use your magnetism. Generate his interest. Whenever you see him, booster. Then invite him ohm to dyne." "Dinner at eight, let's say. Get your wife to break out her best diode plate in his honor." "I get your drift," Mike said. "We'll feed the brute good. Ham and spaghetti. Sort of soften him up, huh?" "That's it, Mike. Now, pretty the old gal up. Have her go out and get her hair coiled. Buy her a germanium. Then, at dinner, don't forget to broadcaster virtues ... amplifier charms." "But that isn't quite honest," Mike protested. "I could lose my job! The boss is strong on employee fidelity." "What's a little distortion in a good cause?" "I just don't know, Doc. Ant Enna can be a bad veractor." "It'll work, Mike. Her trouble is, she's been repressed. Give her half a chance and she'll currector dissipation." "You're a great guy, Doc!" Mike exclaimed. "I feel better already." The doctor walked with his patient to the door, and in parting, clapped a jovial hand on his shoulder. "Sure thing!" Mike replied. "Soon as I unloader, you and I are gonna go out and throw a big calibration!"